I am not the world’s biggest tech geek. There are, admittedly, people who write for this very blog who know a hell of a lot more than I do about gadgets, operating systems, emails, etc. But that doesn’t mean I’m not interested in our increasing relinquishment of flesh-and-blood responsibilities in exchange for technological advances of exponential complexity. I’m what you might call feverishly intrigued. I’m also on constant lookout for signs of the impending robot apocalypse. Recent news, however, has actually gotten me excited for the future, a welcome change from my state of constant fear. Over the last century, science fiction’s been fervently trying to break into science fact. 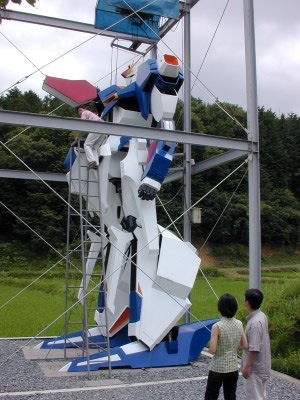 When the Japanese get tired of ogling giant Anime robots, they build their own. When DOD scientists log too many hours on the Xbox, they come into work with super soldier schematics. Then there’s the guy who turned himself into Bumblebee. Plenty of modern technological innovations derive at least some inspiration from science fiction, or at least have been so popularized by it that public demand ensures people will strive to create even the most impractical gadgetry (are you telling me you don’t want people to figure out how to make a lightsaber?). Does everything fit into neat, tidy, Point A-to-Point B relationships? Of course not. But that doesn’t mean the connections aren’t there. Last June, Microsoft dove headfirst into the casual gaming ocean when it announced Project Natal. This revolutionary camera tech promises “controller-free gaming,” meaning any idiot with limbs and a voice can play Natal games (such an idiot could also just play Charades). Another magical power Microsoft purports Natal to possess is the ability to scan real world objects and render them in the game’s virtual space. Think Star Trek Holodeck technology but in reverse. It’s been almost a year since the initial announcement, and the public’s still pretty much in the dark about the whole thing. Natal is supposedly a codename, but no alternative names have surfaced (it’s not like we haven’t seen stupid names take off before). A 2010 holiday release is expected, but we’ve heard nothing regarding price points or bundles. The only concrete detail I’ve found is assorted confirmations of some noticeable lag – a flaw that apparently caused Nintendo exec Saturo Iwata to pass on the Natal tech before Microsoft snatched it up. Natal holds significant promise beyond the world of gaming. Remember the scenes in Minority Report where a pre-Crazytown Tom Cruise navigates his computer by gesticulating like a maestro? Imagine never having to touch a grimy keyboard again. In a world where we can manipulate a device by simply waving at the screen, Apple’s iPad begins to look like a half-measure. Screw your object-oriented interface. I want to conduct the opening bars to Beethoven’s Fifth and have my computer queue up the fifth straight-to-DVD Beethoven movie. It’s you. You’re the Rocket Man. During our decade-end coverage last December, I took the Aughts to task for failing to deliver on a myriad of Future promises perpetuated by science fiction: flying cars, robot butlers, ubiquitous space travel. However, I neglected to mention possibly the most important of them all: jetpacks. Object-based, touch-screen user interfaces are all the rage. Apple revolutionized the phone (and mobile computing) market with the iPhone. Its attempting to do the same with the iPad. They look poised for at least modest success, seeing as how we’ve grown accustomed to scrolling through menus with our fingers and typing on virtual keyboards. Despite my affinity for the tactile clickety-clack of actual keys, I’ve always appreciated the flexibility of these devices’ visual real estate. User input doesn’t have to conform to the standard keyboard/mouse setup. Input can be tailored to whatever’s onscreen. But what if there is no screen? A combined team of scientists from Carnegie Mellon University and Microsoft’s Redmond, WA research lab have harnessed body acoustics to transform your arm into a touchscreen. Dubbed Skinput, the tech merges low-frequency sound detection with tiny tiny pico projectors. The user wears an armband on their upper arm, which does two things: detect the sounds made when you tap various locations on your arm and project various images/interfaces onto your arm. Do I sound like a crazy person come from the future to confuse you? Just watch. While developer Chris Harrison discusses Skinput’s creation as arising from work on other projected interfaces, I can’t help but see similarities to the Omni-tools in the Mass Effect universe. Okay, so Skinput can’t hack terminals or “rapidly assemble small three-dimensional objects from common, reusable industrial plastic,” but it can probably connect to devices that can. Wireless technology (Bluetooth, etc.) can connect Skinput to other devices like your iPod or cell phone. Also, the shot of him playing Tetris reminds me of that kid in Children of Men playing his puzzle game in the Court of the Crimson King. Early adopters may look a little silly tapping their veins like heroin addicts trying to find the right song for their morning jog. But if this can release at a reasonable price point and in a comfortable armband, Skinput should go over like gangbusters. As I said before, I’ve spent the better part of the transition out of the Aughts railing against this Willennium of ours for not giving me all the comforts of a Jetsonian world. Clearly I was wrong. Jetpacks are coming. Soon I won’t need my hands to play videogames. And if I want to use my hands, I can just play games on my hands. Thanks, science fiction!